25SR-43-4-5L No 5 ft. 46-1/4" 43"
25SR-43-4-10L No 10 ft. 46-1/4" 43"
25CRR-50-4-5L-P Yes 5 ft. 50-1/4" 43-3/4"
25CRR-50-4-10L-P Yes 10 ft. 50-1/4" 43-3/4"
There are many factors to consider when choosing to convey pallets through your facility. The obvious being the weight of the loaded pallet, mapping out the path the pallet needs to take, and determining how fast it needs to get there. Some of the not-so-obvious things include how the pallet itself is constructed, what type of pallets are going to be used, and what kind of product will be sitting on the pallet. Our expert engineers are available to help you spec the right solution. We can help you design a complete pallet handling system with stretchwrappers, robots, palletizers, and more. 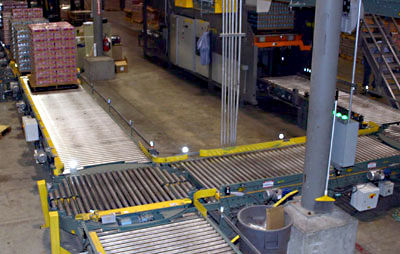 Which Pallet Conveyor Type Fits Your Application?